Thank you... Your 3 Secrets will be delivered to you in a moment! Check This Out Until You Get It! "We want to help you make more MONEY and have less stress." I want ALL 99 Proven Ways Now! I get it... broke, stressed and struggling is no FUN! It's painful. As a matter of FACT... We had a server use one of these proven tools and she got a $100 tip the first night she used it. Our clients servers, waitresses and bartenders are using these proven tools to make more money during every shift. If you had an extra $20 right now what would you do? Pay your cell bill? Put gas in your car? Go out with friends? I'm not here to say what you should do with the extra cash. I want you to understand that you can start making more on your next shift if you use these tools. These are based by real research by great schools like Cornell but they are easy and FREE or very cheap. Don't you deserve to make more? This has all 99 Proven Tools so you pick the ones that work for you! They provide you a path to making more money and having less stress. Aren't you ready to make more money and have less stress. Do you stress about money when you go to bed and wake up each day? That has to be a terrible feeling. Not knowing how you're going to pay your bills or being worried that friends will say let's go do X and you know you can't because you don't have any money. Don't you want to have less stress, more fun and more money? Less Stress. There is enough stress in your world already. Why not make a little more money so you don't have to stress as much about paying your bills. Getting a raise is hard. Most servers make less than minimum wage and going to the boss and asking for a raise is usually a guaranteed NO. Once you know these tips and tools. You'll wish you knew them months or even years ago! The best time to start making more is TODAY. You know that stressing and worrying about not having enough money isn't going to make it any better. 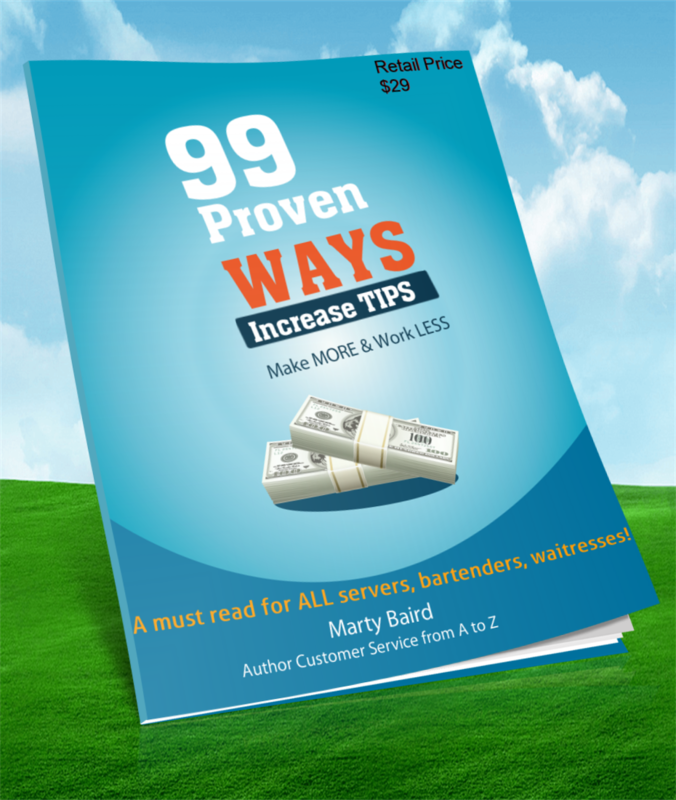 Keep one thing in mind: these 99 Proven Tools for increasing your tips have been tested and proven. Sure you could spend the next several days Googling how to make more in tips and search through the 47,000,000 results and try to find the winners versus the DUDS! Now, it's time to decide... are your ready to put these to the test? Are you ready to stop reading and take action so you can make more money? We've done all the hard work and tested many of these to find ways that you can make more money on your next shift by increasing your tips. Think about it... if you increased your tips by 10% what would that mean to you? Easy: These tools are fast and easy for you to put to use. They WORK: We've had people make more in a night than they usually make it a week just by using these tools. Did you know: Things as simple as a candy, smile or joke can increase your tips. Think of what else you can add to your shift to increase what you make! Look at number 37 - This simple tool made a server and extra $100. Get Your Copy Now at Our Special LOW Price! All 99 Proven Tools for only $7! You are fully protected by our 100% Satisfaction-Guarantee. If you try 3 of the tools and you don't see your tips go up by at least 3X what you paid ($21.00), just let us know and we'll send you a prompt refund. No questions asked. If a person used this to make an extra $100 why not charge way more than $7? The answer is simple... I'm an advocate of paying it forward. If this helps you have a little less stress and more money that makes me very HAPPY! My best days are when I can help others. My guess is your next question is, "Why isn't FREE?" That's easy too... If you spend $7 you are more likely to use it. Researchers found that most people don't "value" free information. I want you to use this to make more money and reduce your stress. This is only available for a Short Time! Most people spend more than that at Starbucks! P.S. : Life is tough and not having money makes it even harder. I created this list to make it easier to make a little more money and have a little less stress. Maybe you'll be the next person to get a $100 tip using these proven tools?